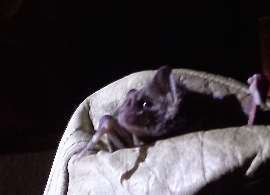 Caught in a mist-net, or bat trap, this is one of the common bat faces seen in Monteverde. MONTEVERDE, Costa Rica – Bat expert Richard LaVal places plastic tarps onto the hood of his 2002 Kia Sportage in preparation for a night of mist-netting, or trapping. He has been researching bats, including the impacts of climate change in Monteverde and surrounding areas, for nearly 40 years. Now 77, he is not interested in slowing down but instead has turned his attention to educating Costa Ricans as well as visitors from abroad. LaVal shares his lifetime of knowledge with private and public groups in the field and at the Bat Jungle, an interactive museum he helped create and open in 2006. On this July evening, LaVal and bat biologist Vino De Backer, LaVal’s former graduate student, are heading out to capture bats with about 20 U.S. and Canadian high school students who are here as a part of a National Geographic student expedition. De Backer helps LaVal lift six metal, 2.5-meter poles to the top of the car and straps them tightly with blue rope on top of the tarps. Grey, badminton-like nets patched together with white string are already packed into the car. With steady hands and poised bifocals, LaVal commands his vehicle up a dirt road from his home on the outskirts of Monteverde. De Backer leans back in the passenger seat, resting his arm on the door. Originally from Belgium, he came to Costa Rica eight years ago and has been enthralled with Monteverde and the cloud forests ever since. Much like the giant forest trees, he has grown roots with a wife and six-year-old son. Dracula and Twilight’s Edward have shaped a negative image of nature’s midnight pollinators and pest control. But bats play a huge role in pollination and seed dispersal in many parts of the world, and the Monteverde cloud forest is no exception. “Without bats, there’s no life. Forget the birds and the butterflies,” De Backer says. Meeting with groups like the one this evening is an opportunity to impart the facts and the necessity of bats in all ecosystems, urban and rural. “I want to get the message across to as many people as possible,” LaVal says. LaVal holds a Ph.D. in wildlife science from Louisiana State University, and started scientifically trapping bats in the 1970s. He has recorded changes in bat species and behaviors over the years, something he attributes partially to climate change. Bat species that like cooler climates have become rarer, while those preferring warmer temperatures have become more common. A break in the tall green vegetation lining the road opens up the view into the rolling hills and a sea of green grass. 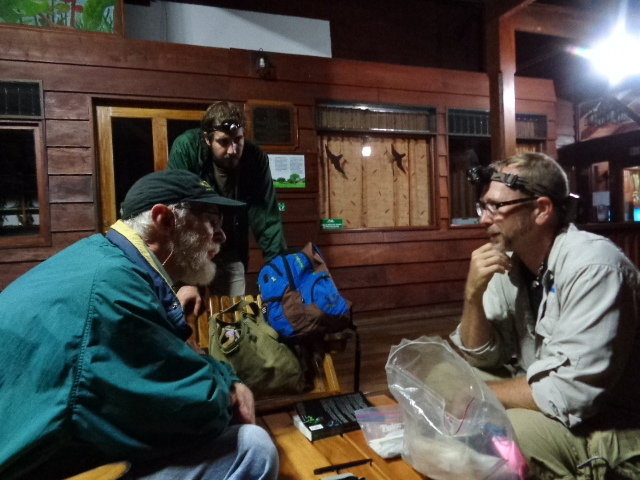 LaVal and De Backer have reached the summit and now start to head down toward the bat trapping site located in a forest behind the University of Georgia Costa Rica Campus. The students are staying there for six days, and the group has paid $200 to observe the bat capture up close and learn from the experts. 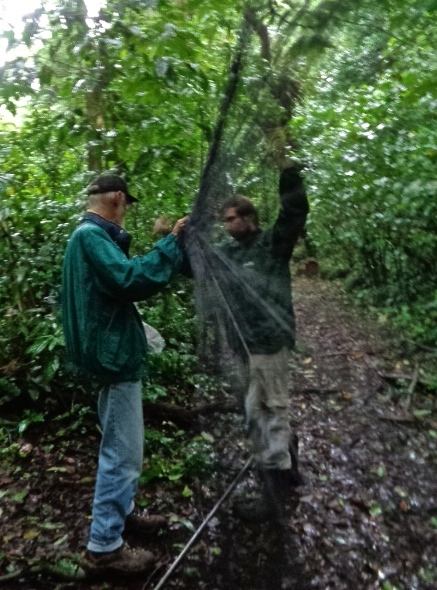 A light rain blankets the forest and the bat experts as they scout places to set up the nets. It’s half an hour from sunset and the waning light reflects off the waxy, wet leaves. Taylor Edwards, National Geographic science expert and University of Arizona conservation geneticist, strolls down, a cup of coffee in hand. “Do you guys need any help?” De Backer declines and drives the first pole into the soft fertile ground as the precipitation mats his dark brown hair. 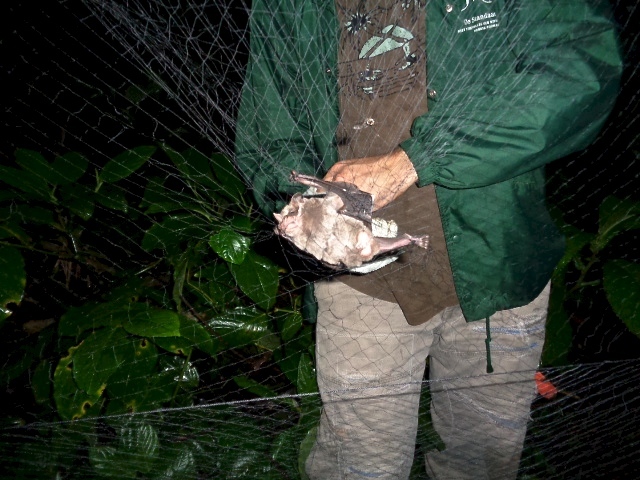 LaVal has been mist-netting for over 50 years, during which he estimates he has captured and released about 50,000 bats to collect scientific data. Each bat is a data point, and the data’s value increases with quantity. A census of 10 people tells a narrower story than a census of 1,000 people. The same can be said with scientific bat mist-netting. “We don’t set up a lot of nets. Four is our average number. We don’t really want to catch a lot of bats. Sometimes we do anyhow,” he says. Teaching is about the variety of bats, not the quantity. Displaying the same kind of bat multiple times is not as educational as showing the wide breadth of bat species the ecosystem has to offer. Setting nets at a certain height will catch a certain population of bats that fly low, LaVal explains. It’s harder to catch bats that fly high in the canopy. During his research from1973 to 2002, LaVal tied changes in the bat populations to Monteverde’s shorter wet seasons and longer dry months. “What was documented was that temperatures were rising,” he says. Biologists and ecologists are seeing this trend worldwide. Species like bats are climbing the elevation habitat ladder. “We are seeing changes of bats at different elevation everywhere,” LaVal says. De Backer carries the companion pole about 12 meters away and plants it in the ground. LaVal starts to stretch and unroll the net in De Backer’s direction. The fragile nets, prone to tangles, can cost about US $100. The sunlight starts to fade. De Backer keeps the net taut and shines his flashlight on the knotted areas. LaVal pushes his bifocals up the ridge of his nose as he works out the kinks. “We don’t like to set up traps too early because birds will get caught,” De Backer says. Bats have great eyesight and agility and never fly into windows, De Backer points out, while some of their less agile, feathered friends do. “In the case of birds, for example, we (in Monteverde) have some really interesting species that are found only along the Continental Divide. Those species are probably going to become locally extinct with increasing temperatures. But the bats that have this high altitude distribution are found on the other side in different climates,” LaVal says. Despite changes in what kind of bats will be found in Monteverde, LaVal believes none of the species will go extinct. Bats tend to have huge migratory and sometimes habitat range that helps keep most of their brethren off the endangered species list, according to LaVal. LaVal makes his way down the path to where Edwards and the high school students wait in an outdoor clearing on campus. De Backer finishes fastening all the nets to the poles. He waits, clutching cloth bags imprinted with Batman and orange Halloween bat patterns. After 10 or so minutes pass, he makes the rounds between the three nets he and LaVal have set up. He is in luck, a vampire bat and a fruit bat are entangled in the net. De Backer holds the vampire bat with a gloved hand and gently pries its wings and thumb claw, a distant echo of a human thumb, from the net. He places each bat into a different cloth bag and gently knots the top. He brings the first catches of the night to LaVal, Edwards and the students. Bat experts Richard LaVal and Vino DeBacker, who live and work in Monteverde, and National Geographic science expert Taylor Edwards discuss the various bat species found in the area. A frenzy of voices breaks out. Edwards has to remind the students that bats have sensitive ears. The students form a circle around LaVal and the bats, clamoring to get a look. “They get a real feel for the biology of the bats. People who are scared of bats or think they hate bats are quick converts. They hold the bats and say, ‘Oh it’s the cutest thing I’ve ever seen!’” LaVal says. The students only get to gaze at the vampire bat, but one student holds the fruit bat which is gently touched by the others. Cameras click without flash. The lucky student holding the bat then walks a short distance away and releases it. De Backer makes the approximate one-hundred meter trip from the nets to the students about six times this night, bringing back a total of about six different species. The trapping concludes and the students mosey back to their quarters, comparing photographs they have taken. After they leave, LaVal and Edwards relax on an outdoor porch illuminated by overhead lights. Edwards pulls out his copy of LaVal’s field guide, Murciélagos de Costa Rica, and asks LaVal to sign it, connecting bat enthusiasts from Arizona and Costa Rica with the brush of a pen. •Some kinds of bats eat fruit and nectar. These bats help pollinate the rainforest, says bat expert Richard LaVal. •The probability of a person getting rabies from bats is very low. If there is a bat foaming at the mouth and acting in an unusual manner, LaVal tells students, leave it alone and do not touch it. •Bats eat bugs, including disease-carrying mosquitoes. “No bats, no natural control on diseases,” says bat expert Vino De Backer. •Bats only have one baby per year and there is a one in two chance that the baby will die once it starts to fly, according to De Backer. •Vampire bats like warmer temperatures. 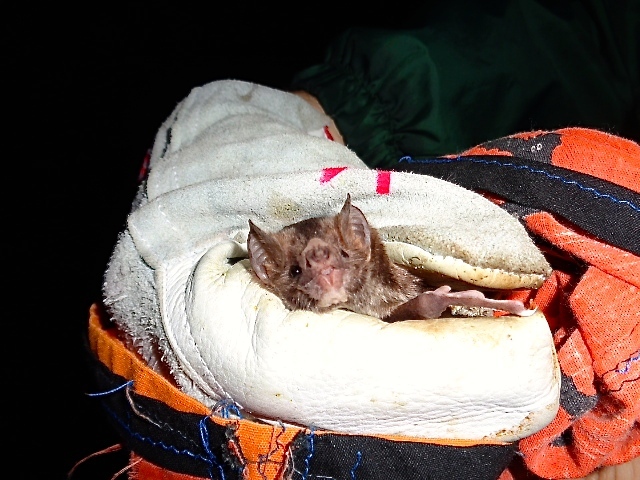 Climate change in Monteverde might increase the population of vampire bats in the area, says LaVal. Editor’s note: This story was also published in Tico Times.